It’s been a while since tube/valve gear made any extended appearance in any of my homes. Nothing against the gear, but what with graduation and traveling and not settling down it just wasn’t practical. This is not to say that in my time I did not possess tube/valve gear from Audio Research and Conrad-Johnson, but those times were indeed fleeting, and with the renewed interest in tube/valve gear by the public I thought it high time, now that I’m more situated, to start taking a look at what’s new. Having attended and covered more than a few Hi-Fi shows, I would always make my way to the Rogers High Fidelity exhibit room where their gear was coupled with Burwell & Sons horn speakers. There was something about the sound. As I got to know Roger Gibboni, Rogers’ President & chief designer, and Rob Pleyer, its Director of Sales, I became more and more comfortable with them, to the point that I could ask to audition their idea of a 21st century integrated amplifier, the 65V-1, a class A, singled ended, lower power design. The unit they sent came with EL34s, but purchasers can specify their preference for KT88’s if they so desire. It took a while for me to become accustomed to using an iPad to remotely control the 65V-1 and, mind you, I’ve always been an early tech adopter. Still, being as it was the first time encountering such, I had to remember that when grabbing for the remote that, given it’s an iPad, it does indeed multitask, and for that reason just might be off somewhere in another room. Note: In my communications with both Roger and Rob of Rogers, I pleaded with them to think about making the iOS app available for the iPhone as well. And from what I understand some new designs will be iPhone compatible, and I’m hoping the 65V-1 will be retrofitted. The remote-control app and its virtual VU meter are critical. The meter is calculated in watts from 0 to 25 and it samples both channels’ power output and in turn displays continuous average power. Simply put, Rogers would like its customers to note when they start to hear clipping, and then turn the volume down to just about 20% below this level. For the uninitiated this takes practice. It is not an insurmountable task, and while the iPad remote control is not absolutely necessary, it is fun, but the purplish LCD-like display can be hard to read at times. The 65V-1 is a kit that an engineer could just … its look, its feel, the mechanical switches really brought me back. It is physically imposing at 17” W x 7.5”H and 12” D, but at 24lbs, the 65V-1 is lighter than I would have thought. As stated earlier, the model sent to me came with Mullard EL34 tubes/valves, I could have requested KT88s as well, but I let Rogers decide. To be fair, this started out as Rogers being rather friendly to me and sending me the unit to audition and not review, so I can get a better read of Rogers as a company, its design philosophy and workmanship. Over time, I became entranced to the point where I just wanted to share my experiences with my readers. You will notice in the picture above that one of the toggles is expressly for switching between headphones and speakers. It’s a nice feature to have as I made great use of the headphone jack when I transported the 65V-1 from my primary listening area into my office, where I work more often wearing headphones. This is an oddity, as I cannot stand wearing headphones in my normal listening configuration, but when sitting near field, I’m okay with it. Hmm. This will require some self-exploration. 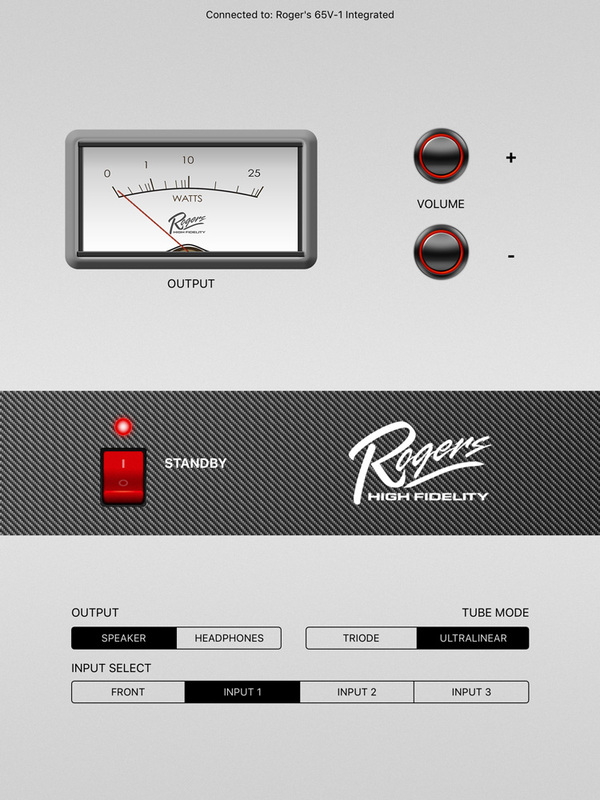 Note: While Rogers does supply a headphone jack, one is not likely to purchase a 65V-1 solely for that purpose. It did an admirable job of powering my Audioquest Nighthawks and Meze Classic & Neo 99 and, if anything, I would say this functionality is a very welcome feature and for some could be a deciding factor in comparison with similar tube/valve integrated amplifiers lacking such. Connecting the 65V-1 is pretty much straightforward. About the only thing I could mention is that upon powering up users should note that there is a red light on the power toggle. This indicates the unit is powered on. The digital display will take about 60 seconds while the filament slow-start circuit starts up. This slow start circuit is designed to significantly increase the tube lifetimes. Yes, there is a Bluetooth antenna that comes with, and yes, it is easy to screw on and install. The iPad remote control will not work without that being attached. These speakers range from 90 dB to 97 dB in rated sensitivity by their respective manufacturers. The 65V-1 played nicely with all of them. The AX-2 being rated at 90 dB gave me some initial concern, but that’s when more fun began as I started switching between Triode and Ultra-linear output modes. Long story short, as I wrestled with the idea of providing a history of and detailed definition/description/differentiation of the modes, the number of pages and the sheer boredom started setting in. Again, I am not going to put you, my readers, through that. What I will say is that in ultra-linear mode the 65V-1 appears to pack more punch, although it comes with a loss of detail in comparison to triode mode, in which less sensitive speakers fare worse and the higher efficiency speakers let me relax and soak in the finer detail and the nuances of the recordings in my listening sessions. Here’s a breakdown of how each of the speakers fared with respect to output modes: the Audio Note AX-2 and Blumenstein Audio Marlin speakers sounded fuller and more authoritative in Ultra-linear mode. The Blumenstein Audio Orca, Tekton Design Mini Lore Monitor and Klipsch Quartets took just about everything in stride and flourished in Triode mode. My primary listening room is large (24’ x 20’) and I must say that with the appropriate speakers the Rogers 65V-1 filled the room with sound. The ephemeral glow of the tubes at night was an added plus. They transported me back in time…fade to a Montgomery Burns moment. The 65V-1 felt at home in my office as well, I just had to clear up some space, which forced me to de-clutter as its footprint is noticeably larger than either my Bel Canto Design s300 or the truly diminutive PS Audio Sprout 100. 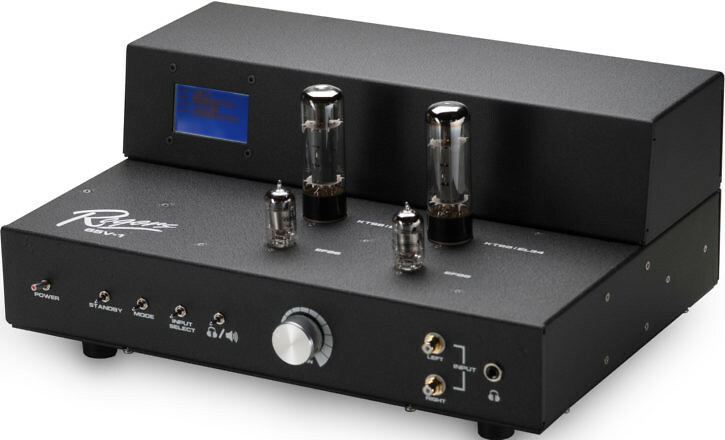 Well built, professionally designed and taking a bite out of 21st century technology, the 65V-1 could very well be the tube/valve integrated amplifier for this generation. There’s more going on under the hood.